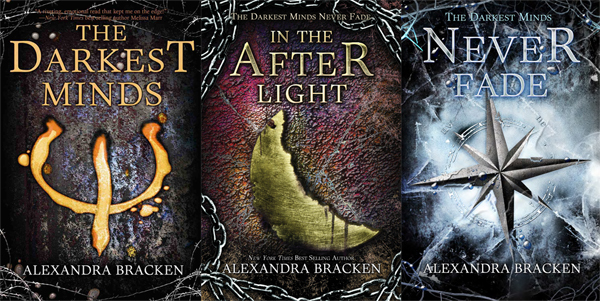 I honestly do not know why I did not read Alexandra Bracken’s The Darkest Minds (“TDM”) trilogy sooner. Goodreads knows, it has been thrown in my face enough times. I was lucky enough to find the first two installments, The Darkest Minds and Never Fade, in paperback at my local book outlets (I desperately needed some off-screen time) because the books seem to be out of print in Australia. And while it was a struggle to switch to an eBook when I progressed to the final book, In the Afterlight, this has a been one my best reading experiences ever! The world building was brilliant, in that Alex (May I call you Alex, Ms Bracken?) spends a lot of time and effort to paint this grim future and what it means for the characters therein. She qualifies the political and socio-economic dynamics of the era in way that is not only easy understand but thrilling and thought-provoking. The overarching theme of choice, persons having the right to decide what happens to their bodies was thoroughly debated and while the trilogy’s conclusion did not give you a definite answer, it cleverly outlined the heady arguments for/against it. Mostly, the above was delivered in an entertaining manner so the reader can choose whether to be swept away in the debate, be entertained by it or a bit of both. Further, Alex’s brand of science-fiction did not need you to suspend your belief all that much. It was not overly complex and facilitated/molded the narrative effectively. While the plot is certainly intriguing, unpredictable and well-paced, TDM’s crowning glory has to be its ensemble of characters and the dynamics between them. Ruby was such a beautifully complex character and quite easy to relate to. Arguably, she is empathetic to a fault but I believe that this quality allowed the reader to delve into the psyche of her surrounding characters despite the narrative being from Ruby perspective. Ruby was so realistically complicated, equally strong and vulnerable, determined yet doubtful, loyal yet cautious, sassy but awkward, broken/damaged but hopeful. She was gorgeous and I loved accompanying her on this bittersweet journey. Liam was adorable and effortlessly likable, if not dynamic like Ruby. His inherent optimism in the face crushing odds was admirable. He was fiercely principled and did not deviate from it, even when it put his relationship with Ruby or Chubs in jeopardy. The evolution of Ruby’s relationship with him was delightful, once you got past the heart-breaking bits. His interactions with other characters were also equally delightful, particularly with Zu, Chubs and Cole. Chubs, Vida and Zu were Ruby’s confidants, cheerleaders, comic relief, therapists, healers and were almost as well crafted as Ruby herself. I thoroughly enjoyed their immaculate comic timings as well as the moments that made me choke back tears. In short: friendship goals! Cole is easily one of my favorite characters of the trilogy even though arguably there is very little of him to go around. However, whatever Alex served of him, I lapped it up eagerly. He was so devastatingly charming for someone in such a precarious position. He was this frustratingly unrelenting fixed point, fierce and admirable. Ruby and him shared a fantastically unique dynamic. Cole’s complex personality mirrored Ruby’s in many respects and Alex could have very easily upgraded their relationship from platonic to romantic. While the Cole fan girl in me would have rejoiced this development I cannot appreciate Alex more for crafting their relationship they way that she did. I also liked how Ruby and Liam dealt with her close relationship with Cole. Clancy was as unsavory a character as they come. I believe he represented the anti-Team-Ruby who let his suffering turn him into a monster rather than mild him into a beacon of hope. However, I enjoyed his dialogues with the other characters, so deliciously manipulative. He is the YA Bond villain we did not realise we needed. His priorities were frightening, though! It is quite a big read, especially if you read it consecutively over a week, like I did. The narrative does dip in sections but it is infrequent and brief and the otherwise breakneck pace more than makes up for it. I would have loved to have a little more interaction (or altercation) between Liam and Cole. I felt that there were several unresolved issues and that neither character fully grasped where the other was coming from. Arguably, they had a couple of the book equivalent of off-scene times so they may have resolved it then. In Summary, The Darkest Minds trilogy (The Darkest Minds, Never Fade, In the Afterlight) was a wonderful experience. It is right up there with my all time favorite binge reads (The Lunar Chronicles, Heroes of Olympus and The Divergent Series). The emotionally rich and thought provoking narrative is cleverly balanced with great pace, thrilling action and instantly likeable characters. Run, don’t walk to your nearest bookstore (digital or otherwise) to grab your copy! You would not be disappointed. As I started reading this I could not help making comparisons with Tahereh Mafi’s Shatter Me series but the comparisons stopped shortly after the initial few chapters. Mafi’s series was embarrassing, immature and at times, just plain ridiculous. TDM is nothing like it. So if you, like me, saw hope in the Shatter Me franchise’s premise but hated the execution, TDM is the YA read for you.